Women encounter muscle cramps on a somewhat regular basis, and they can occur in localized areas all over the body. They can vary from slightly uncomfortable to extremely painful, and so it is recommendable to understand some of the reasons why they might happen, and the best ways to treat them. This knowledge can help you to avoid further cramps in the future, and enable you to relieve any pain as quickly as possible. A cramp is defined as when a muscle spontaneously contracts and does not relax for a period of time, whereas a spasm is considered to be when a muscle contracts and relaxes involuntarily but rapidly. Most frequently cramping happens in the lower calf, ankles, and feet - a condition colloquially referred to as charley horse. It is also possible to experience cramping in the hands, womb, and other commonly active muscles in the body. Poor diet. Your body needs to be exposed to a healthy diet and sufficient fluids in order to maintain efficiency and functionality. If these needs are not met your muscles are just one component which is likely to suffer, and encounter pain. Exercise. Many women experience cramps in different muscles after they have been exercising, and when they suddenly stop. It is thought that the muscle might contract due to the shock of stillness after being warmed by use. Irregular periods. The wall of the womb is made of muscle, and during your period this wall contracts in order to stimulate the shedding of the lining - which comprises your monthly bleed. This activity can cause mild to strong pain, known as period cramps. Pregnancy. Some pregnant women find that they suffer from increased cramps, especially during the later stages. This is thought to be because of the strain of the extra weight they are carrying. Medication. There is a list of prescribed drugs which include muscular cramps among their possible side effects. These include some diuretics, statins, and medication for preventing osteoporosis. Consume a balanced diet. Your muscles require protein, vitamins, and minerals, and so will benefit from a balanced diet and an adequate intake of fluids - eight to ten glasses per day is recommended. Frequent stretching. This is particularly important after exercise. During physical activity, the muscles become warm, and if you suddenly stop this can cause shock and later involuntary contracting. Stretching will help to encourage blood flow to the muscles which will reduce the likeliness of cramps. Massage. To alleviate cramp pain rapidly, apply pressure to the area and continuously rub it. This will stimulate blood circulation in the required area, which will soothe the muscle and reduce pain. Apply heat pads. Similarly to massage, the use of a hot water bottle or warmed pad can bring pain relief for cramps by encouraging blood flow, and also by affecting the sensory receptors which tell the brain there is pain. 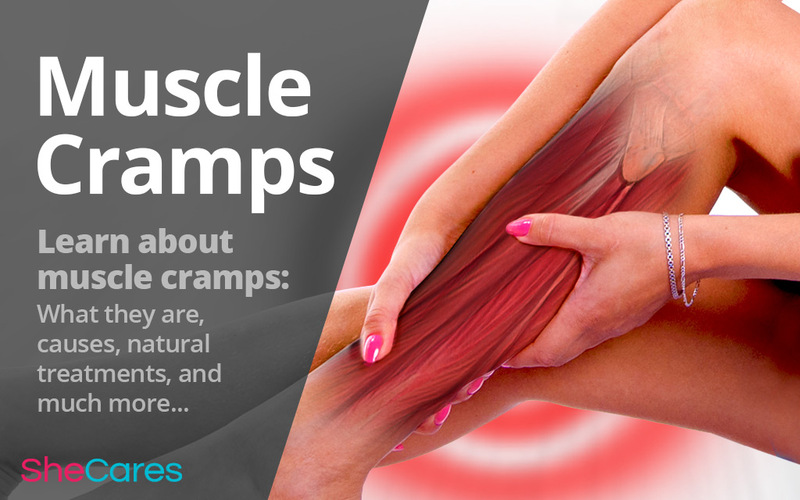 Muscle cramps are unfortunately a common complaint, which can affect women of all ages. In extreme cases, it can stop you from wanting to go out for fear of being struck by a cramp at an inconvenient time. Understanding of the causes, and knowledge of how you can alleviate cramps should help you to learn how to cope with the condition.